The purpose of art, in Tolliver's opinion, was to "increase human happiness." William Tolliver, born in 1951, was a native of Vicksburg, Mississippi, one of 14 children. William remembered at the early age of 7, his mother, who also loved to draw, used to encourage him by having drawing contests between Tolliver, his brother, and herself. "When she realized I was good at it, she used to show me art books." The young artist learned to paint on his own. The Mississippi schools he attended did not have art teachers, so he practiced by himself. First he used oil pastels and inexpensive watercolor sets he bought at dime stores with money he earned mowing lawns. Tolliver then progressed to paints, teaching himself how to mix and blend using paint-by-number sets. He explained that once he saw how colors went together and blended to make other colors, he had learned the system of color blending. Before he even finished half of the picture in the kit the light bulb came on! At the age of 10, he could create "academically" correct (in color and composition) paintings and drawings. "I used the sets to learn how to mix colors. Actually, there is no better teacher to show you how to mix and blend colors because everything is diagrammed, every little spot, and every color. Once I did one or two of those I understood the principles." Tolliver's artwork took a back seat to basic living after he dropped out of school and went to Los Angeles. He joined the Job Corps, where he learned carpentry. From Los Angeles he moved to Milwaukee, and eventually back to Mississippi where he worked construction jobs during the day and painted at night. In 1977, he married and his family grew, and so did the demands on his income. It was in 1981 that Tolliver decided to move his family to take advantage of Lafayette's oil boom. At first, carpentry jobs were easy to come by, but by 1983, the boom went bust and Tolliver ended up unemployed. This led him to begin selling his paintings. – The rest is history. Bob Crutchfield recalls the day when Tolliver walked into the gallery with one of his paintings clutched tightly against his chest as if to avoid showing it as long as possible. "He set it on the floor and backed up to see what we [Crutchfield and gallery director Michael Conway] thought. Neither of us said anything. We were filled with awe. William reached over to pick the painting up, and started to leave, saying 'I knew you wouldn't like it.' Both of us screamed in unison, 'Leave it alone!' That same painting sold and the owners have been offered something like 15 times what they paid for it." Crutchfield believes Tolliver is the most versatile artist he has ever worked with. "He's a master, whether it's an impressionistic landscape or a figurative study or an abstract. He has a complete mastery of color harmony and design. And I would say he's probably the most talented artist we've ever dealt with." 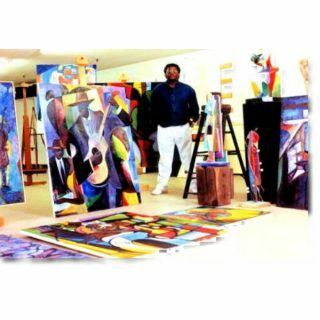 Tolliver stated, "I couldn't imagine someone wanting to buy paintings from an uneducated artist." 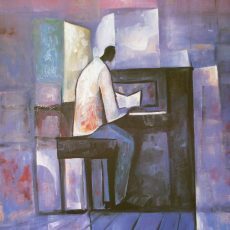 However, his fascination with reading Art Books and dedicated self-education have gave him a tremendous knowledge of everything from art history to art techniques. An average day for Tolliver was 15-18 hours long. Raised on hard physical labor, Tolliver never tired of painting. Long hours suited his basic nature. "I'm not actually sitting in front of the canvas to paint the whole time because you have to get your canvas ready, you have to run around and buy supplies. By the time I get everything together, it's usually around 4 p.m., and I work to 4 or 5 in the morning." Tolliver, after working on a painting for months would always go home to Vicksburg for a few days of relaxations and to gain perspective. 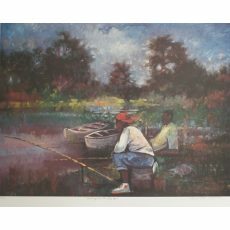 Tolliver spent more than 30 of his 48 years perfecting his skill as a painter. Today, William Tolliver’s art is collected worldwide. Tolliver's style freely combines the color of Chagall with the solid compositional principles of Cezanne and the mood and forms of Modigliani and Picasso. Tolliver's words of wisdom for the young artist were, "I would urge an art student to go to school and learn the fundamentals, because to know the fundamentals is to know the technical aspects of blending colors."